In preparation of our CCNA exam, we want to make sure we cover the various concepts that we could see on our Cisco CCNA exam. So to assist you, below we will discuss preparing for the CCNA exam. If you want to pass your ICND1, ICND2 or CCNA exam on the first try, it is essential you have a sound, effective study plan that is proven and other Cisco CCNA students have followed to successfully pass their 200-120, 101-101, or 200-101 tests. 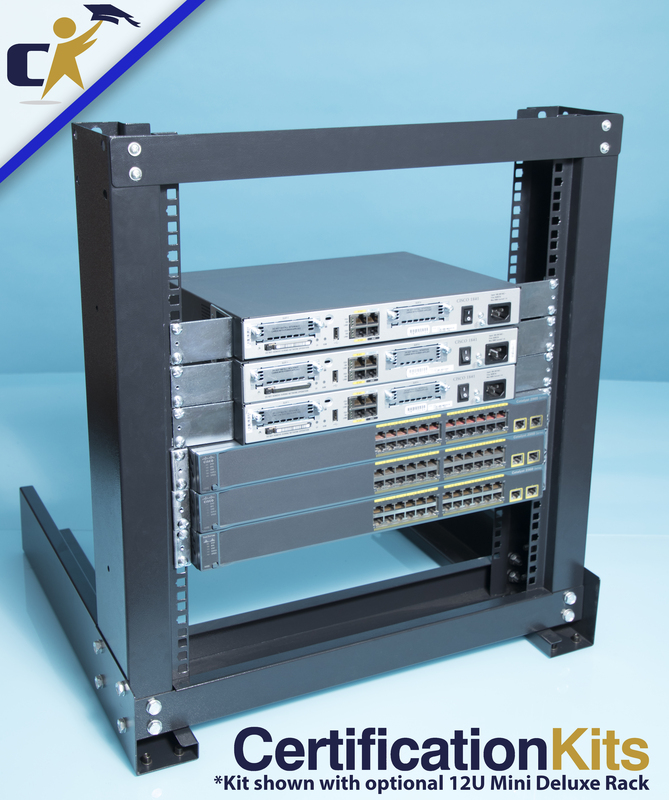 Here at CertificaitonKits, we have on-staff seasoned CCNA, CCNP, and CCIE instructors. These instructors have helped develop Cisco training curriculum, delivered boot camps and have authored various books you will find in Barnes & Nobel or Borders. So we know the material and how to help you prepare for the Cisco certification exams. We believe that an effective self-study plan is going to consist of a variety of tools and techniques to help you pass your Cisco certification exam. We will outline each of these tools below and then provide our suggestions on how to use them in your CCNA self-study plan. 1)	Real Routers and Switches – How can you really be confident and work on Cisco equipment if you never opened a Cisco router or Cisco switch? If you do get a job working with Cisco routers, will you be intimidated by the router the first time seeing it knowing you never actually worked on one? That said, there is so much to learn about these units by having the actual hardware. You can’t duplicate what happens when you have a serial cable come loose or are using the wrong type of cable(straight-thru versus cross-over) daisy chaining switches with a simulator. I don’t know about you, but I learn so much more effectively using real equipment. I also find that most of our CCNA students say the same. The only way to actually see routing and such work and know that you made it work is to have real Cisco routers and switches for your Cisco certification training lab. What I find is that when I mess up a lab about 10 times in a row due to a typo or trying to enter a command at the wrong level of the IOS, when I actually figure out what I was doing wrong….well, I am never going to forget that again! This is actual real hands-on experience! That translates into you actually understanding what went on and helps you obtain the troubleshooting skills so you can methodically work through issues. Again, there is no way to recreate this by just reading a book and understanding theory. So to help you pass your Cisco certification exam, I suggest you invest in some Cisco routers and switches for your lab. You will find it to be some of the best money ever spent on your education! 3)	Lab Workbook – Something that always amazed me is people will spend hundreds of dollars and buy some Cisco routers and switches and have no lab workbook. Well what are you going to do with them if you have no labs to follow? If you are new to Cisco, you will need something to guide you along in your studies. That is where we suggest our Lab Workbook. It is written generically. You can see all the concepts that are covered by clicking on this link 200-120 CCNA LAb Workbook. But at a high level it covers everything from creating static routes, dynamic routes, NAT, Frame-Relay and IPv6. Probably things a new CCNA student cannot do off the top of their head. 4)	Test Engine – A test engine is another invaluable piece of your CCNA study arsenal. A good test engine will help you identify what areas you need to brush up on before paying $295 for your CCNA exam. Our CCNA test engine will help prepare you for the types of questions you will see on the exam. The biggest thing I want to emphasize here is you do NOT want to memorize the questions! You need to be able to understand why the answer is correct or incorrect. Memorizing questions and answers is not learning…it is just memorization! What would happen if you see a similar question on the test that is slightly reworded? You need to understand how to read the question and pick out the right solution. Using a test engine properly will help you develop this test taking skill. Click here view the details of our CCNA Test Engine. 5)	CRAM Sheet – This is a great addition to your CCNA exam prep material. The CRAM sheet we have developed consolidates all the major concepts from the 800 pages of a full blown study guide to a full color, laminate six page CRAM sheet. Please click on this link CCNA CRAM Sheet to view the full details on this product. This is very handy to carry around with you when you have a few free minutes to study here and there so you are not lugging around a big bulky book. You can also easily bring the CRAM sheet with you to cram to your exam. In fact, we suggest you do use it to brush up on the main concepts just before you pass your CCNA exam! Ok, now that we covered the major tools you will use in your ICND1, ICND2, and CCNA self study journey, we are going to provide you some guidance on how to use them effectively. Here is our eight step plan…. 1)	Read the first few chapters of the full blown CCNA study guide you purchased. These first three or four chapters are usually mostly your base theory and then around the third or forth chapter you get into basic router configuration and how to login to the router. 2)	At that point you will want to configure your Cisco CCNA hardware lab. You will pick out some of the corresponding labs in the workbook to follow along with the study guide you purchased. That is why we wrote the lab workbook in a generic sense as there is no way we can know what study guide you will be using or what actual hardware you will have. But now you should be able to perform some of the basic CCNA labs in the lab workbook. Continue through your study guide performing the corresponding labs that are in the lab workbook. 3)	One you complete the study guide, now you should go through one of the CCNA Test Engine exams such as CCNA exam A*(Important note, only do one exam!). After you complete the exam, you want to print out the entire exam so you can review the sections and concepts you got wrong. Also note what your score was for that exam. 4)	Now go back to the study guide and brush up on the concepts you scored poorly on in exam number one. 5)	You should now have a baseline of where you were at with the test score. We want to make sure you are scoring about an 80% before you even think about attempting the real Cisco CCNA exam at $295 a pop. 6)	Once you reviewed all the material once, now go back and take CCNA exam B. Hopefully you are scoring close to 80% by now. You will then want to repeat the above process of printing out the exam, reviewing the sections or concepts you scored poorly on and again leveraging the tools at hand. 7) You should see how you can continue to repeat this methodology while learning and not memorizing the questions. If you memorize the questions, you defeat the purpose of trying to learn the actual concepts. I am quite sure if you follow this road map, you will be scoring close to 80% by the time you get to exam C. Just continue refreshing the material and in no time you will be holding your passing exam score for your CCNA certification!